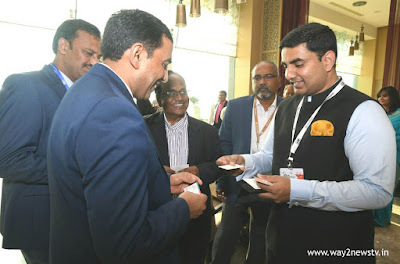 Minister Nara Lokesh met with CEOs of electronics manufacturing companies on Monday at the CII Partnership Summit in the city. Speaking on this occasion, he said, "We have taken many steps to convert Andhra Pradesh into an electronics hub.We have taken many steps for the development of electronics manufacturing sector.Many policies and subsidies are being offered. We have allocated permissions and lands to facilitate quick implementation of the companies.No mobile phone was made here during the division of the nation.At present, every 10 phones manufactured in the country are made in 2 Andhra Pradesh.With the arrival of Reliance, this number will be 5.But in the 10 phones made in the country, Chief Minister Chandrababu has given us the Target to take action in 8 Andhra Pradesh.Thank you all for coming forward to invest in Andhra Pradesh.We are developing cluster model in the form of electronic manufactures clusters in Andhra Pradesh. Chip Design and Battery Manufacture from the manufacture of a full range of goods in Andhra Pradesh to ensure the full-scale ecosystem is being developed.